ERR! Timed out waiting to switch to boot mode: Device not found. and the red and yellow LEDs are blinking. My setup is a Xubuntu 14.04 install in Virtualbox, with Windows 8.1 as the host system. This seems sort of like this, but the retrycount reffered to does not seem to exist anymore. That probably means the DFU mode version of the device is not getting forwarded into the VM. You have to set it up a forwarding rule in the settings dialog, as you probably can't hit the menu fast enough to manually add it. The default timeout of 8s works fine here with Windows in VirtualBox on a Linux host, but if you need to change it, it's right here. I had added the forwarding rule, and Virtualbox found those settings by default, but there seems to be some other issue. It did not help to set a higher timeout, whenever I try to update the firmware, both the red and yellow light keeps flashing until I reset the board manually. Red and orange blinking mean it's in bootloader mode. That is, it received the command to enter bootloader mode, but didn't receive the commands to complete the update, probably because it's not being forwarded into the VM where tessel update is running. While the LEDs are blinking, does it show up in the guest VM? 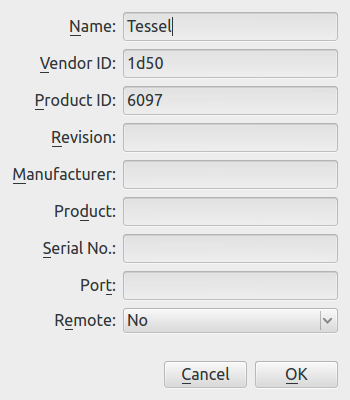 (lsusb and look for 1d50:6097) Does it show up in the VirtualBox USB forwarding menu and is it marked as forwarded? The rules VirtualBox sets if you create a filter from an existing device include filters on the Revision and Product fields, which are different between the different modes. So if you accepted those defaults, try blanking out those fields.